A section of corporate South Africa operates within the global arena. In many cities of global importance or with global aspirations, corporate offices become iconic skylines defining character and place recognition. From skyline to individual building, there is also a collective and singular competition between these corporate entities to proclaim success and importance by using architectural form - sometimes advancing a serious architectural argument, but mostly using that which is superficial to make a statement of the grotesque. In many ways, the meaning of such edifices is situated in excess. In contrast, not many corporate entities find their expression in a subtle and refined contribution towards public space-making. It is even rarer, still, when they are happy for public institutions to dominate them. Usually this relationship happens in reverse. Power is thus derived from the dominance provided by public effort, capital and purpose.The Allan Gray Headquarters relishes its role of 'background building' where public space and the pre-existing are hierarchically more important than it is. Also, only strong, confident and responsible architects refrain from the temptation of advancing the idea of the 'iconic' to their clients.The shape and form of the building are informed by the urban design decision to make the 1920s grain silo (and home of a future art gallery) the dominant element in the local context. Further to this, the decision was taken to align the main entrance and atrium of the building with the historical line of the conveyor belt, linking the silo to the quayside. The space that remained become the bulk of the building's functional space. This seemingly straightforward idea encapsulates the diagram of the building. Again, one sees the mark of talented and experienced architects in that they did not shy away from such a direct conceptual position to form the functional arrangement. The spectacular and vertigo-inducing atrium is the main memorable space of the building. 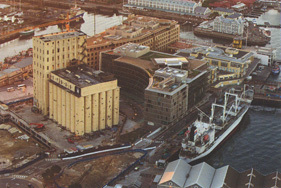 From here, along the alignment of the old conveyor belt, the silo as well as the harbour, from where the grain was previously imported and exported, can be seen and experienced. The floorplates are filled with row upon row of non-hierarchically arranged computer-based workstations. Here, work is done with a focus on the immediate environment, while at the atrium edge, work involving larger groups in open and closed discussion can be conducted. There is a fine spatial balance between the small-scale and somewhat solitary work, and the group work within the larger-scaled spaces.The balance is between the intimate, the 'local' and the larger and externally linked scale. It is also from the interior that the delicacy and openness of the external facade becomes apparent. From the outside, one is aware of just how much care the architects have taken in carefully designing this facade, so that the building can appear transparent and 'negative' However, it is only from the inside that its genius and intricacies are revealed. All the service or 'black box' functional spaces have been placed in the base, or below in the basement. When workers or visitors enter, they only experience the clean and uncluttered visual drama of the building. The facade, the atrium and the well-used and trafficable 'fifth facade' roof places the primary emphasis on the relationship with the outside context. It is delightful and fascinating that this large non-object building is so happy with its status of 'invisibility' while it makes such a primary contribution to the creation of public and celebratory space. The architects wanted 'the building's conceptual foundation and facade resolution ... [to be] informed by the integrity of the industrial and historical V&A Waterfront buildings, whose character [is] functionally efficient and honest, giving priority to practicality over image.' (Architect's Report.) This they have achieved in a convincing and inspiring way. The building also achieved a six-star rating from the Green Building Council of South Africa. Again, all this underpins an achievement in making it appear easy and effortless. What VDMMA has achieved is a level of perfection unseen before in their oeuvre, and generally in South Africa. They have set a benchmark, which others will hopefully follow. If architects and their clients would take the lead from this inspiring example, society would -here and elsewhere- have excellent and responsible places of work as well as cities. This kind of refinement and delicate elegance does not come easy to anybody. It occurs as the result of dedicated work by highly talented and inspired architects. Such achievements only follow from the genius of a team, where all are encouraged to make their contribution according to their talents and insight for the betterment of the whole. Thus, on professional, architectural and urban levels, the Allan Gray Headquarters by Van der Merwe Miszewski Architects and Rick Brown Associates deserves the highest of possible accolades.